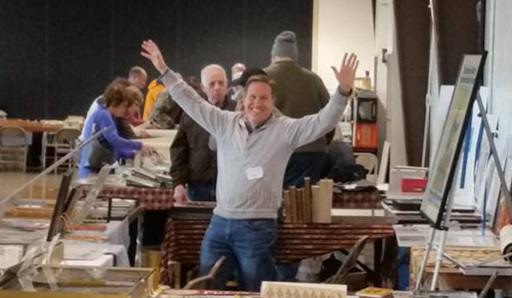 This Sunday, my boyfriend and I decided, on a whim, to check out an event at the Ohio State Fairgrounds: the Columbus Paper, Postcard, and Book Show. This was a fascinating glimpse into both the strange world of the collection of ephemera and into the history of writing, books, and the role of paper in all aspects of American life. As I am preparing to teach a class on the history of the book, it was astonishing to see, nestled alongside the more expected abandoned family photos, tourist postcards, and first day stamp covers and preserved in clear plastic baseball card sleeves: driver’s licenses, Navy ID cards, matchbooks, train passes, concert tickets, fraternity dance cards (with miniature pencil still attached! ), and old valentines. The mundane evidence of lives lived. Some merchants had bins of unorganized items for $1 each; others had highly curated collections of military papers and memorabilia. People sorted through piles of picture postcards and autographs, gathered cat books, and sifted through piles of old black and white photos of unknown people--I overheard one woman tell another, as she got up to move on to another booth, “happy hunting!” It was a friendly crowd, and one vendor said that he had probably sold almost as many things as he had bought from the other booths. It seemed like a swap meet. It was lovely. I once again had a vision of a cultural history project involving postcards sent from Europe back to Ohio…possibly of castles....but I digress. I had a lovely conversation with him about a box of honeymoon ephemera and love letters from the 1920s, and why he kept the set together, which led to me mentioning my job at OWU. He then showed me a stack of 50 letters written by an OWU alumnus from 1868-1871. They are all written home to his parents in Caledonia, Ohio, clearly saved by them at some point and somehow passed down as a set for almost 150 years. 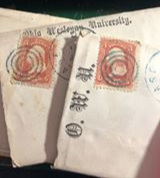 Mr. Keesee had purchased them at the estate sale of an autograph collector, and though each are valuable and resellable just because of the nature of the envelopes they are in with this particular type of cancelled stamp, he does not like to break up collections, instead trying to keep documents together. We had an engaging conversation about his collecting and selling of papers, about how he finds such troves, and about the potential for using these collections to tell Ohio histories. The letters were a bit expensive for an impulse purchase, and I am a medieval historian, not an Americanist. But there were fifty of them, and they are darling--just look at this letterhead! I thought that maybe I could add my skills to the work of Dennis, the autograph collector, James’ parents, and unknown others who saved and sold and stored these documents over more than a century, and we could collectively pull a lost voice out of the past.